Is this too fun for Halloween lovers, or what??? I haven't felt very craft this week. I've been a little under the weather. 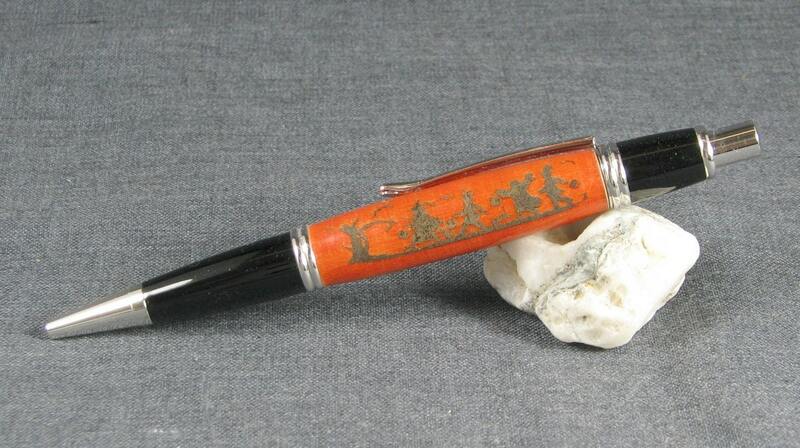 So, I thought I'd share this cool Halloween pen that my husband made and has up for sale on his Etsy shop! 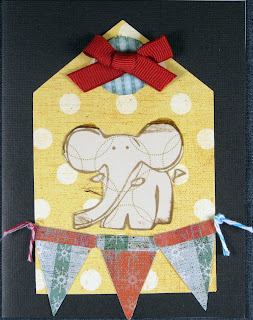 I've obviously flipped the sketch on this little Thinking of You card! 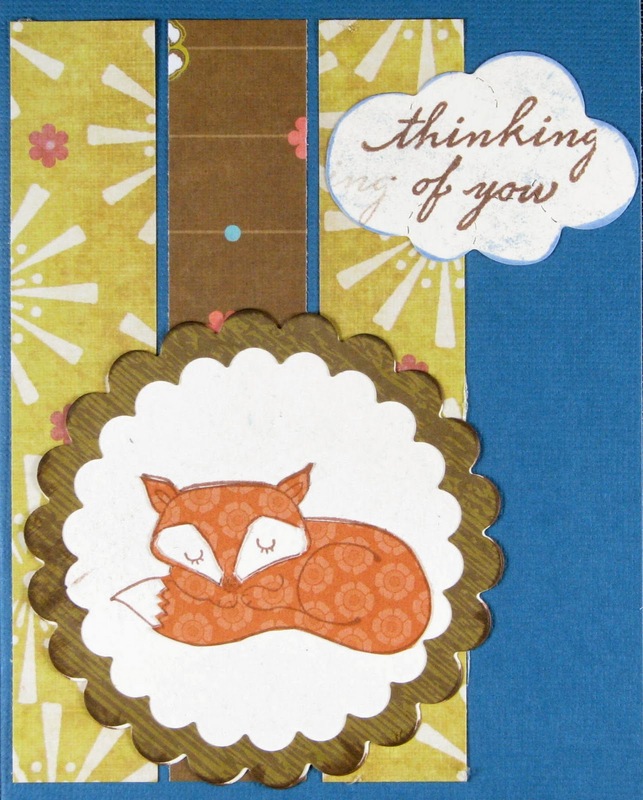 I paper-pieced this darling Hero Arts sleeping fox card from a Hero Arts Presents… a Sketch Challenge! and am also entering it in Simon Says Stamp, Anything Goes Challenge. I don't do a lot of paper-piecing because I find that it is difficult to use a crafting knife to remove the unwanted paper, but I thought this little fox deserved the extra attention! Kraft, Pink and White - Day 3 of Artful Delight's Birthday Celebration! 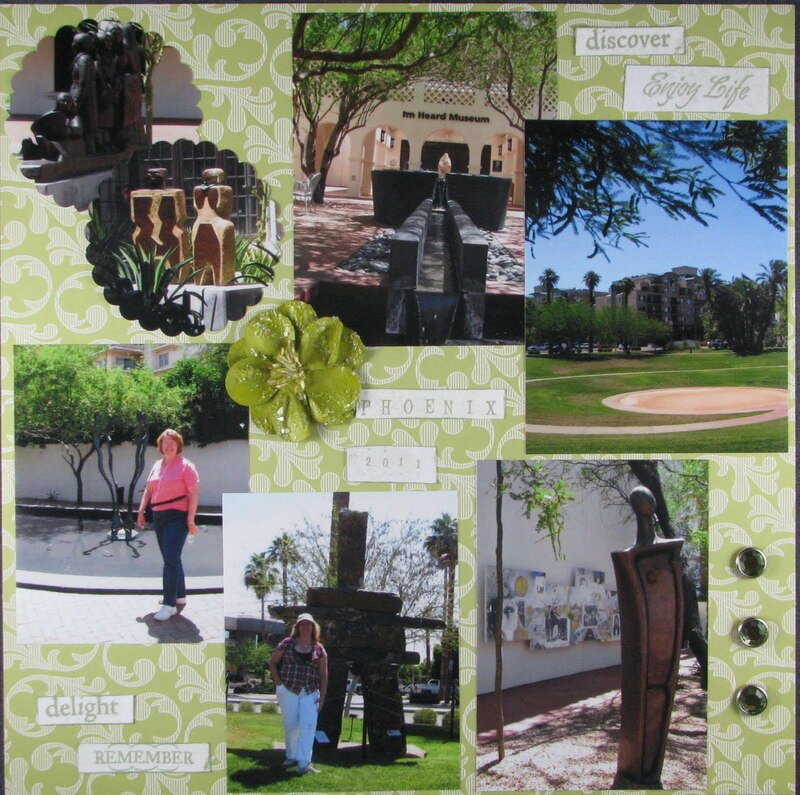 Well, it is Day 3 of Artful Delight's Birthday Celebration! 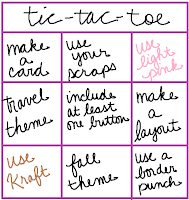 For this challenge, you were to make a project with Kraft, Pink and White! 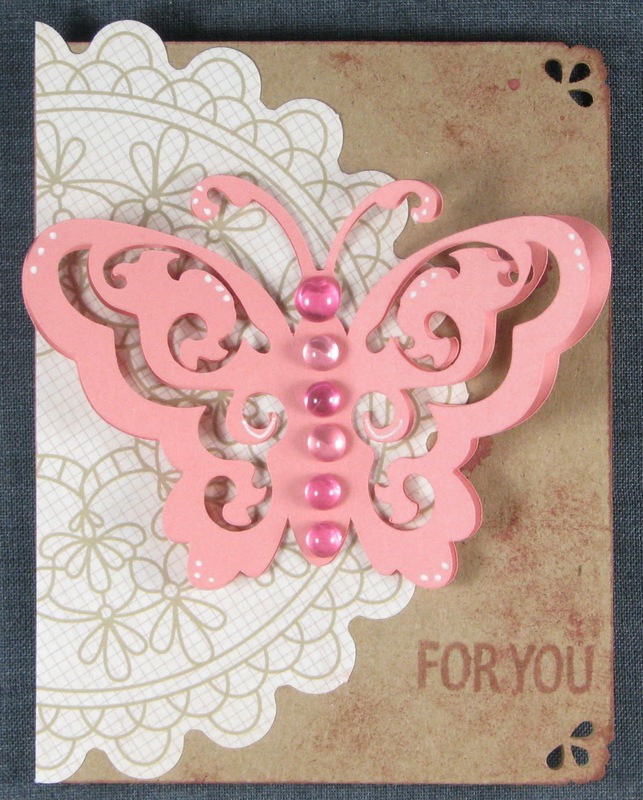 So, I whipped up a quick little butterfly card. I left the inside blank so I could use it for a birthday card or a thank you card! It could also be a "cheer you up" card! I had fun making projects for the birthday celebration!! How many of you would like to be a part of history???? Well, the history of the making of a book anyway... A very sweet lady contacted my husband, Steve, a while back about the idea of featuring one of his kaleidoscopes in a book she wrote about a girl who goes to the Upper Peninsula in Michigan to visit her grandparents. There she finds all kinds of interesting things/treasures, including a kaleidoscope! Anyway, this nice lady has run into some funding issues. She needs to raise $5,100 in a hurry in order to have her wonderful book published! I know it is wonderful because I had the opportunity to read it in a draft form!! I sure hope it gets published. 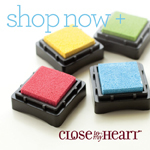 If you donate $75, you will help her and also receive one of Steve's mini kaleidoscopes! They are so much fun!!! She will take donations in smaller amounts, of course, even $1! 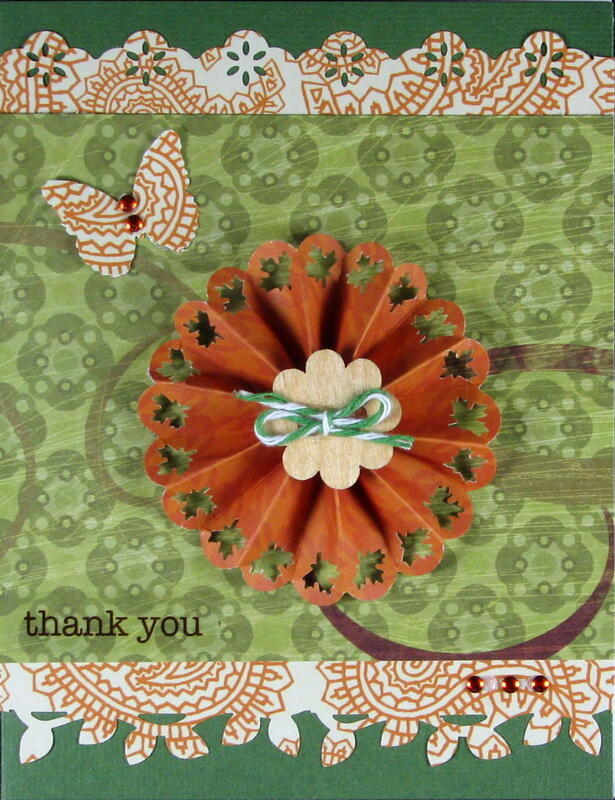 And now, a Card (My third post of the day) I think it is a record! UPDATE: 9/30/2011 This card was selected to be showcased on Create (Northridge Publishing) blog! Thanks for visiting!!!!! I really appreciate it! Thanks for visiting. I'm posting a couple of things today! 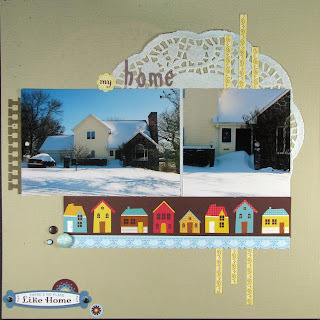 I made this layout for The Paper Variety's challenge to include the word "home", a embellishment, or a house theme on your paper project.using Sketchy Thursday's latest sketch! I found these photos of our home in a big snow back in 2006 when I was looking through old Christmas cards recently. I thought it was fun that the perfect sketch and challenge came up right after I found them! 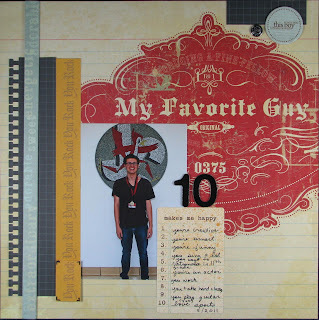 I made this layout using numbers for Scrapbook Circle's and Sweet Peach Crop Shop's number challenges using a sketch I found at My Scraps and More! 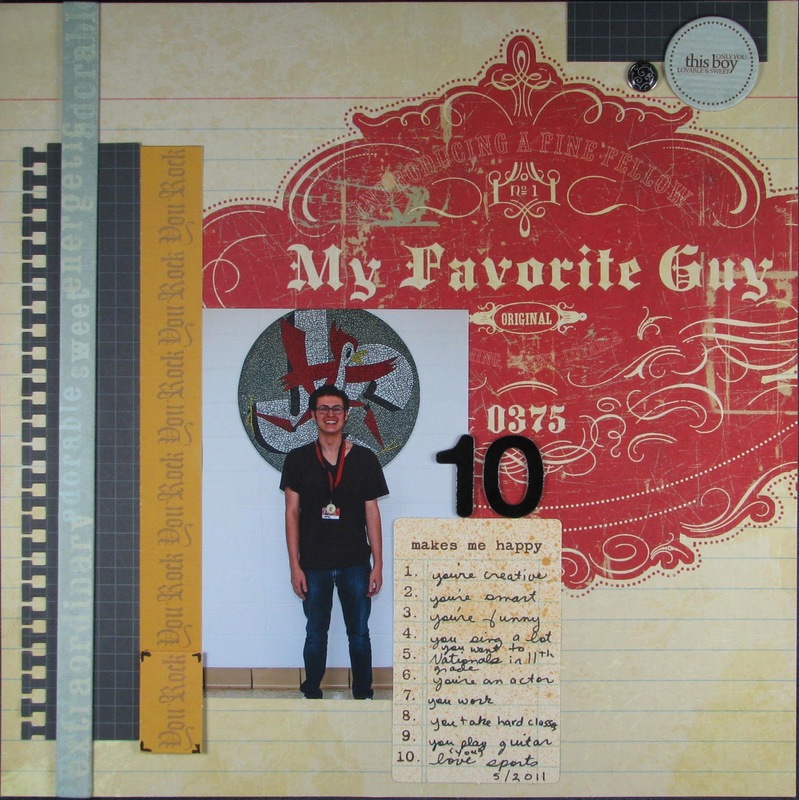 It is now hanging on my refrigerator to let my teenager know that I do love him and see the good things about him even though I have "rules" and seem to get on his case from time to time! 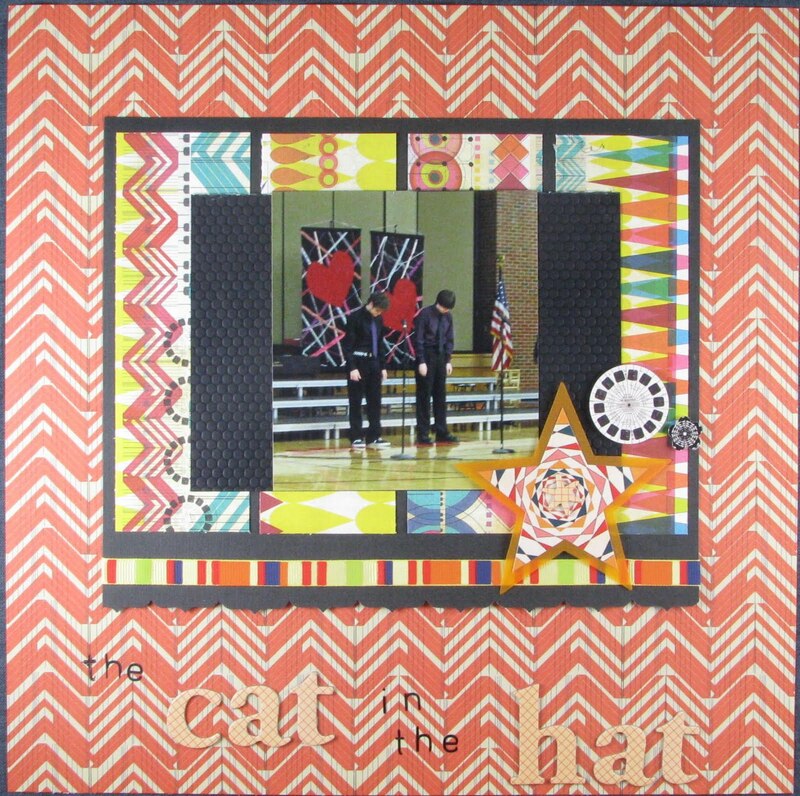 I have quite the hodge podge of manufacturer's on this page including American Crafts, Autumn Leaves, Basic Grey, Collage Press, Kaiser, My Mind's Eye, October Afternoon and more! Thanks for visiting! It makes my day! Hope you are having a great day! Isn't Popcorn the Bear, from Crafter's Companion so cute? I just love him to pieces! 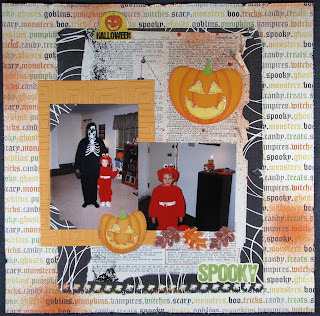 Here is a fall card for their September challenge! 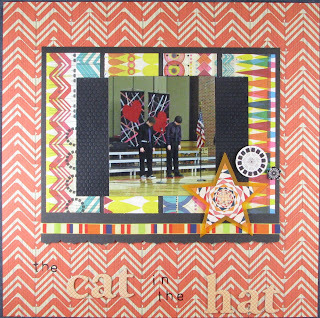 I am also entering it at Ribbon Carousel Challenge which is new to me for their RCC 21 Fabric of Our Lives with Linda challenge!!! 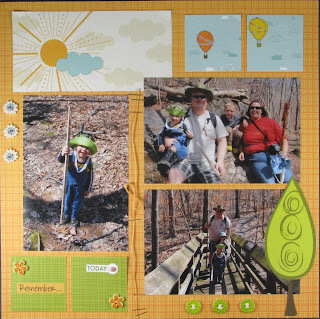 I fussy cut the leaves from a CTMH stamp! 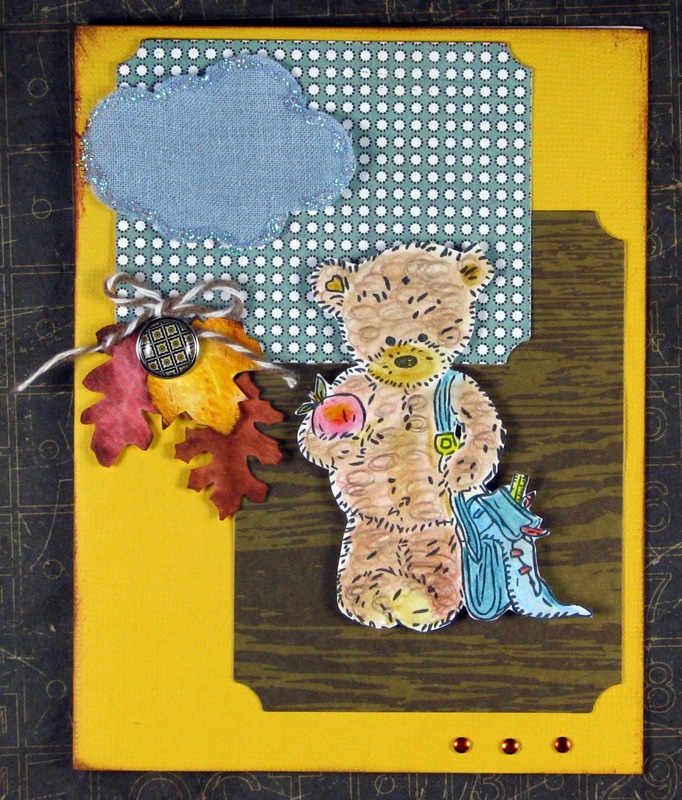 I also added a little glitter around the Sizzix cloud that I made out of pocket material from an old pair of jeans! I have also added some liquid glue to the apple and pop dotted Popcorn! I thought it turned out really cute! Did you? I haven't been very crafty since last week! This is the extent to which my craftiness led me this week so far. 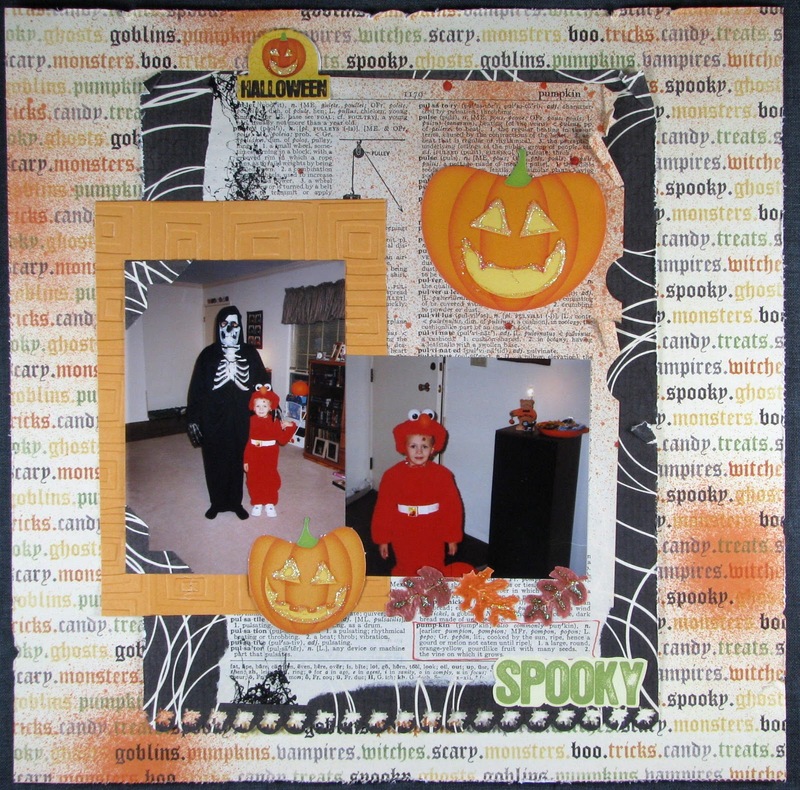 I am planning on doing some scrapbooking today!!! I made a tag on a black base card for a couple of challenges: Simon Says ,,,,, Dies to Die For challenge. The die I used is the Sizzix tag. 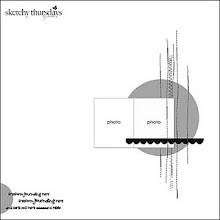 I also was inspired by Moxie Fab World's Tuesday Trigger: Delightfully Random! I used red and blue and the banners! I also entered my friend Stacy's challenge to use a tag! Thanks for stopping by! It makes my day! Here is my twin sister in various moods at the Heard Museum in Phoenix earlier this summer. 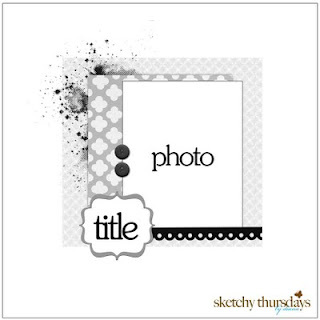 I was really excited this morning when I found this sketch by Sketchy Thursdays and the combined "friend" challenge at Scrapfit!!!! I'm crossing my fingers that I'll get lucky this week! I play these two challenges all of the time and haven't won a prize on either challenge--now, mind you, I have been very lucky all over blog-land winning prizes, and I am not complaining! I just love the prizes being offered this time! 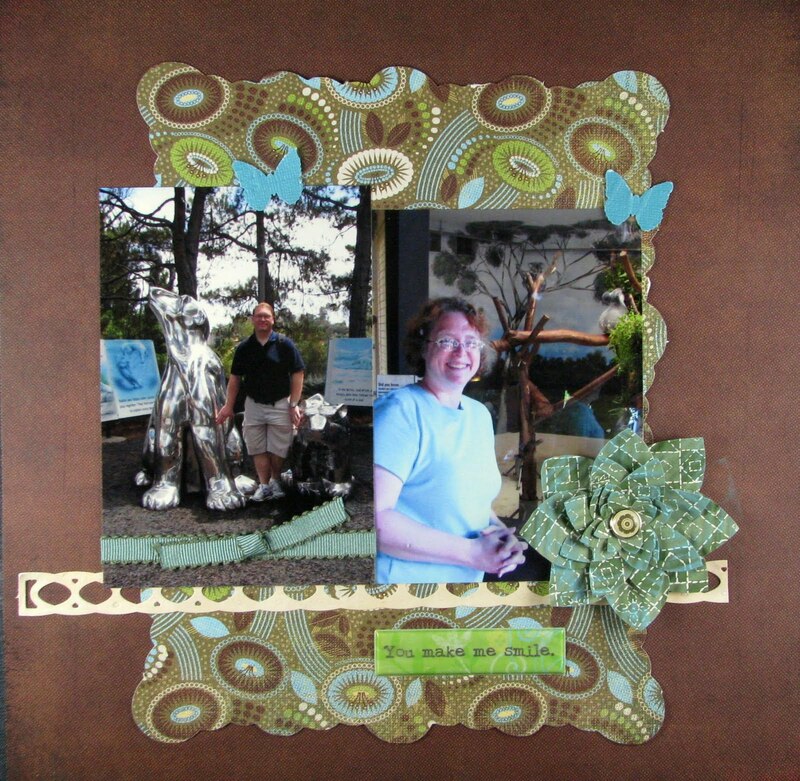 :-) My friend Stacy wanted tickets on a layout, too. They represent "ticket to fun" to me. I've won many of Stacy's challenges, so I play for fun (though I still win a lot) there and hope more of you will play along so she can send prizes out to as many different people as possible!!! She's such a gracious and friendly host! I did a little spritzing on the layout which is hard to see in the photo but looks pretty good in person! I'd been hoarding the multi-colored clouds for a while as the company who makes them is no longer in business to my understanding. Thanks so much for visiting! I won't be posting much in the next few days!!!! Steve loves polar bears, and I love koala bears! Actually, I love polar bears, too! But, I chose these photos because they were some of our favorites at the San Diego Zoo. 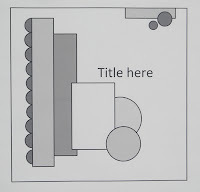 I meant to place the photos a little more to the left, but I had already peeled the paper and photos off for another issue... 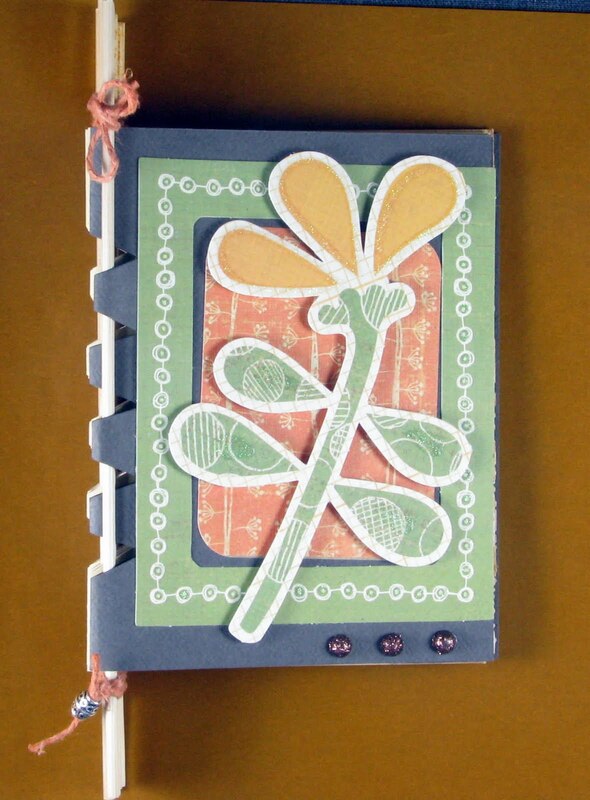 I made the flower with several layers of Sizzix flowers which I then crimped and inked with some turquoise to go along with the paper and butterflies. The layout is not wonky in real life either... I made this using Frosted Designs lovely sketch! I'm in a hurry today because for the first time in his life, my hubby locked his keys in the car, and I am going to take them to him and have lunch with him also! So, yay for that! 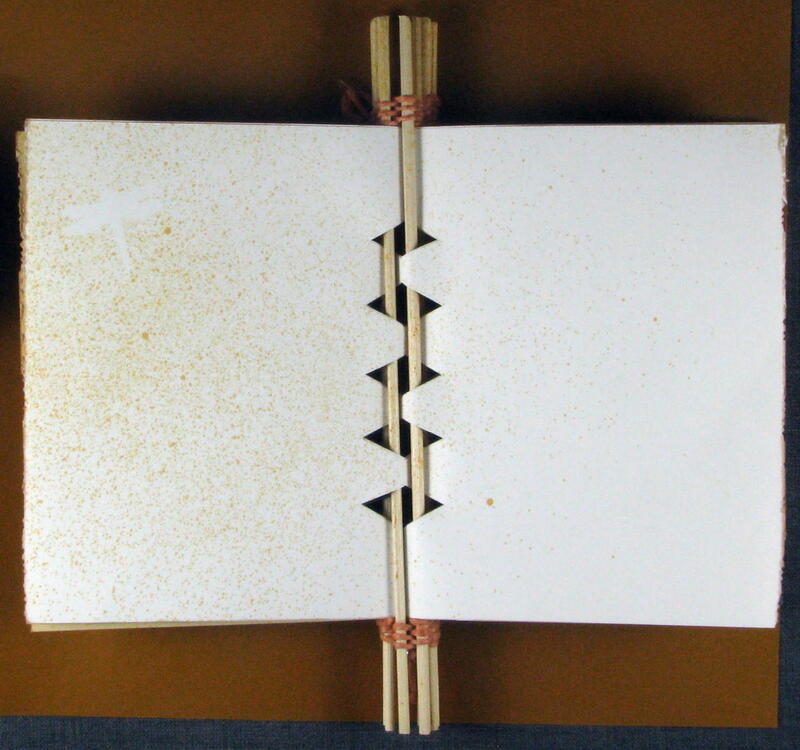 Reposting my Handmade Skewer Book for Craft Buds! If you think you have seen this book recently, you have! 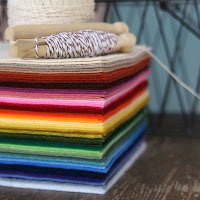 I am reposting it because Craft Buds "in honor of Craft Book Month, [is] hosting a linky party all month long to celebrate. From September 1st through 30th, you may link up one of your favorite craft book projects  for a chance to win some fabric, books, patterns and more." 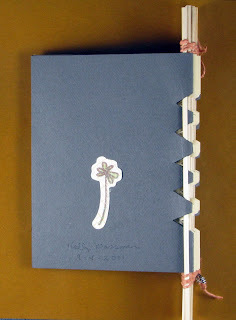 Mine was made from Handmade Decorative Books! 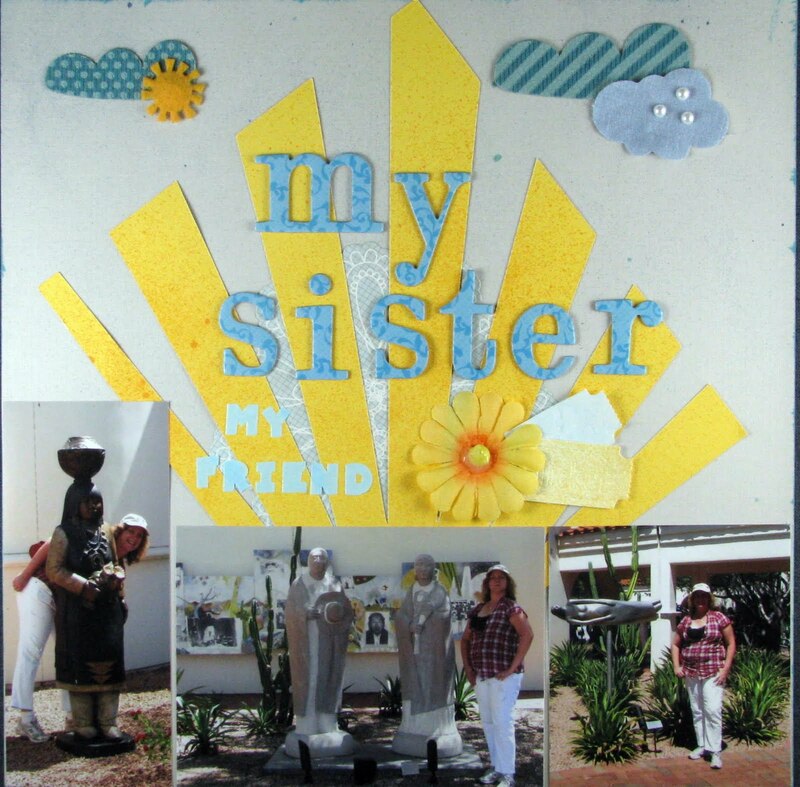 My twin sister and I had so much fun in Phoenix that I went a little wild in printing photos! 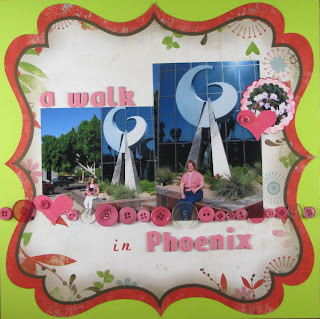 Here are a couple of photos of us on our walk around downtown Phoenix--it was really near our hotel, in fact! I used Sketch Inspiration's Sketch #237 to make this layout for The Paper Variety's My Favorite Embellishment challenge! I think you can tell that I chose buttons! I think there are 20 buttons on this one! I don't know if buttons are my favorite because I hate to leave the other embellishments out...but I do use them a lot and love them!!!! Thanks for visiting! I hope you have a great week! If you are anywhere near St. Charles, Missouri, this weekend, come out and see us at MOSAICS--(Missouri Festival For the Arts)! I understand there will be over 100 juried artists there!!! I decided to do the monochromatic challenge at The Paper Variety. Since I was keeping it simple, I thought "what the heck, just go with as many photos as you can." 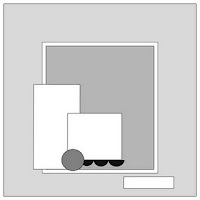 So, even though this is as simple as it gets, I got 7 photos scrapped! Yay! And, I chose my favorite color: green! 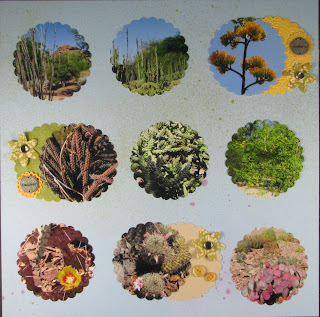 I was a little out of my comfort zone in working with such wild papers, but they fit The Paper Variety's challenge to use a favorite photo! I'm also entering it in a sketch challenge from my friend Stacy! The photo is one of my favorite pictures of the school year--not because the photo is so good but because of what it represents. Mitch and his friend Adam were getting ready to perform their interpretation of The Cat in the Hat in front of the WHOLE school!!!!! It is pretty much the only photo I got of the performance. And, you know, I didn't get a video of it either! They worked so hard all year and even made it to Nationals with the piece. I picked this wild and crazy paper because of the sheer amount of energy and action these guys put into their performance. They. never. skipped. a. beat! They had to change voices and actions constantly! I was really proud of the effort, and it was hilarious! Plus, The Cat in the Hat is pretty wild anyway if you think about it--so the paper fits there, too! It is rare for the Speech and Debate team to be showcased in front of the school! Word was definitely out around school at how great the performance was, and one of Mitch's teachers made sure this made it to a school assembly!! Yay! I hope they find as good of a piece this year and win at Nationals!!!! 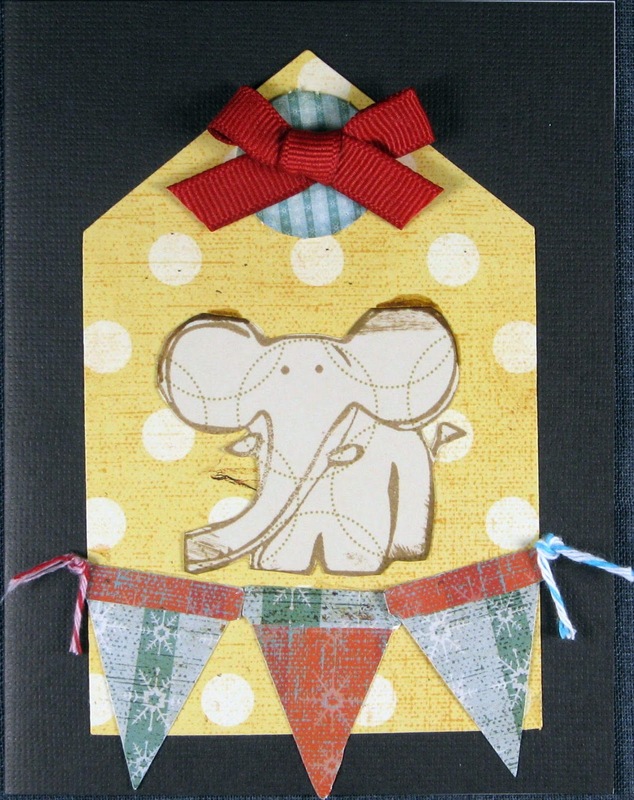 I made this funky little card with an MFT stamp for The Paper Variety's challenge to use a stamp! That was also my friend Stacy's challenge this time.. . The pp is Basic Grey. I wish I had time to relax like the little bunny! The Paper Variety is having a celebration! They are having all sorts of challenges. 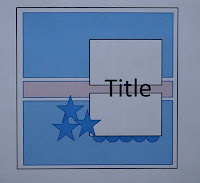 For this one, you were to make a layout using your favorite manufacturer! 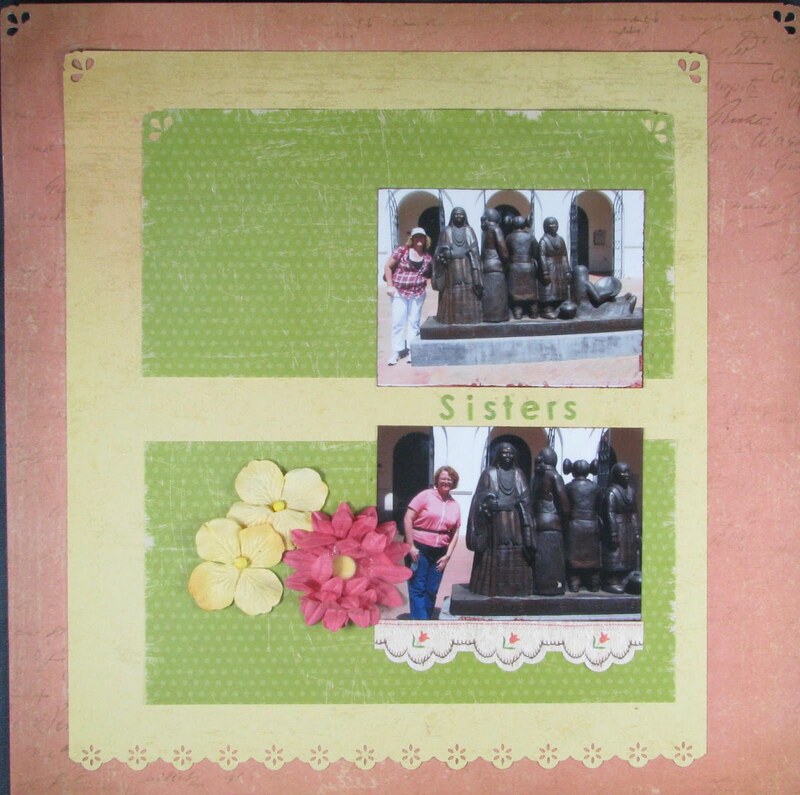 I have about 20 favorites, but I chose to use this darling collection from Bella Blvd. This is Steve's younger brother and family on a hike! Thanks for visiting! I hope you have a sunny day! This weekend we are doing a show with my husband's work. He is demoing turning on a lathe, too! People love to watch it, and he loves sharing!!!! Here is a quick layout of my nephews (Steve's youngest brother's kids). They were hiking with their parents. The monthly sketch over at Artful Deligh seemed to go along with the photos. 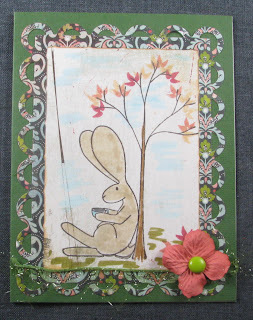 I used a crimper on the leaves and then inked them with Tim Holtz distress ink. 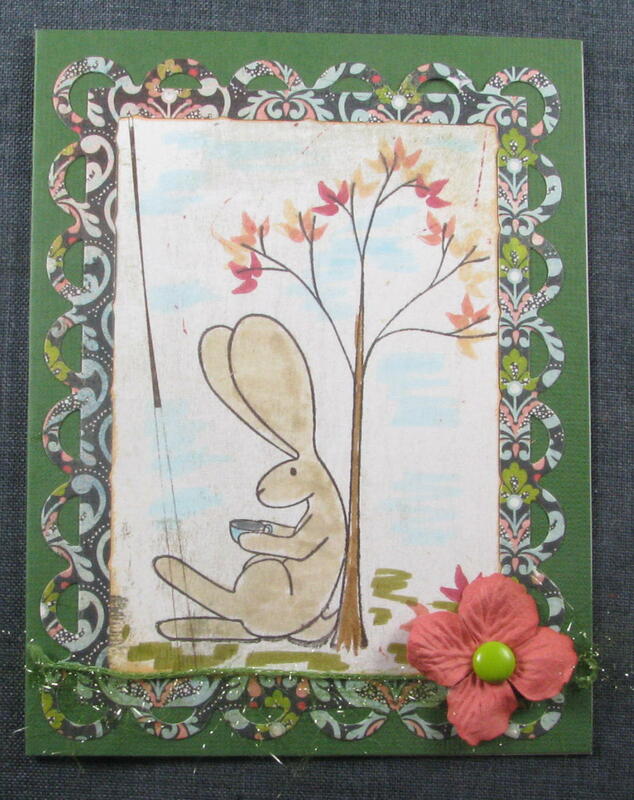 I made this for My Scraps and More sketch challenge! Thanks for visiting! Hope you are having a great week! My sister and I had some time to kill at the airport when our trip to Phoenix was over so we decided to head up to the rooftop of the airport terminal. We had such a great view. We were glad someone told us to go up to take a look. 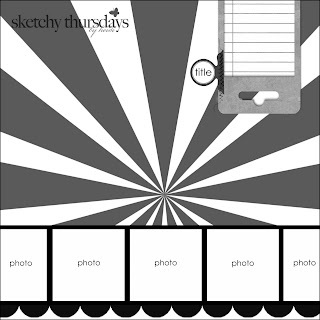 I made this layout with Sketchy Thursday's 9.1 sketch challenge--I flipped it, though! 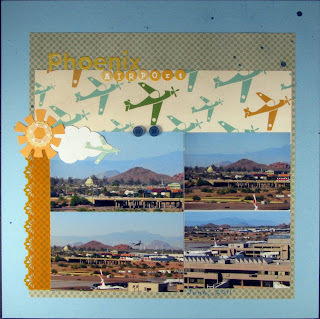 I love that airplane patterned paper from Studio Calico! 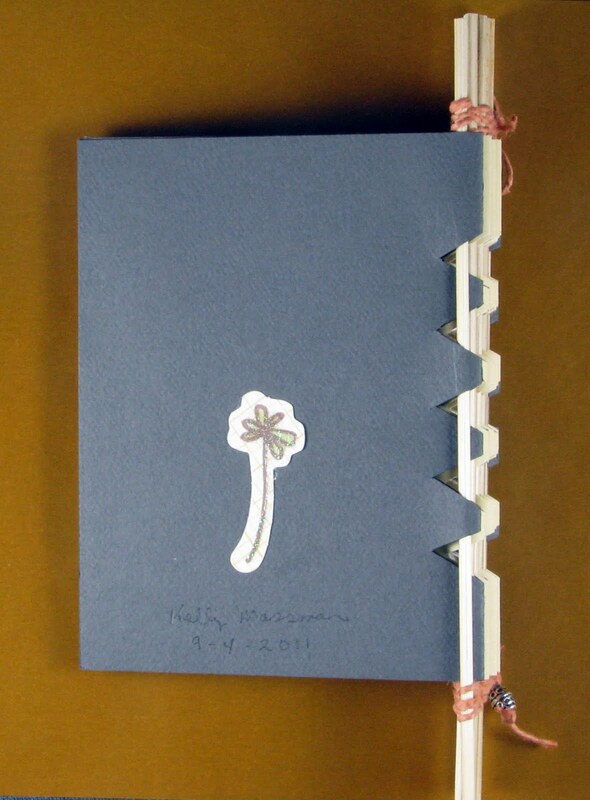 I've been thinking a lot about hand-made books for the last few weeks. I found a great book on them at my library a few weeks ago, and you might say that began my complete fascination with them! I made a mini a few weeks ago that was so simple. 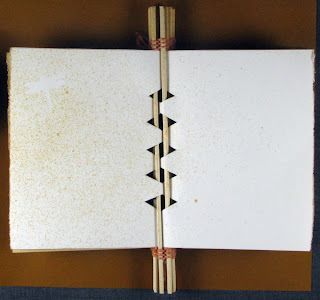 This skewer binding book is a little more complicated but not so bad--especially when you happen to have a fantastic blog in your reader whose author just so happened to post a tutorial via Ustream video yesterday!!! It was made from Handmade Decorative Books! Sarah's work is so great! 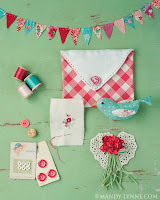 She makes the best shabby chic stuff and is just an all around nice lady. I love listening to her voice in the video! If you go visit her, please let her know that Kelly Massman sent you over! Needless to say, Sarah's books are much prettier than mine, but I had so much fun making mine that I will probably make more!!! 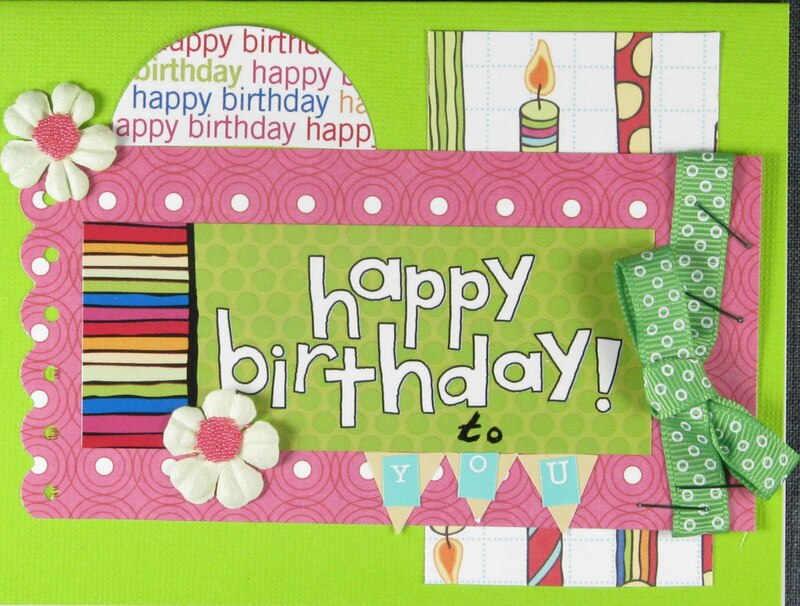 I made this birthday card for The Paper Variety's Happy Birthday with a banner challenge using CPS 234 sketch! I thought they went perfectly together! 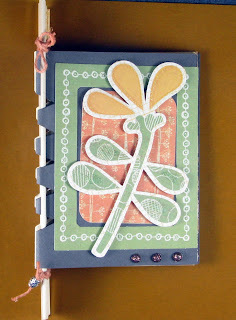 I used Scenic Route papers and had fun using Martha Stewart micro-beads in the center of the little Prima flowers! 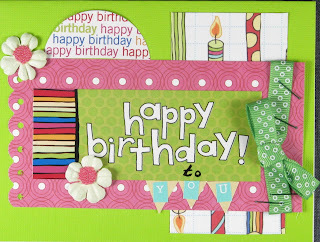 I think the colors are so cheerful in this card, don't you? So anyway, happy birthday Abby!!!! Hope you have a great one! Now, I hope you don't mind if I get very personal. I have a niece who has lupus (like me) and is having a hard time of it right now. It is looking like she is having some organ involvement with it--I'm hoping nothing too serious. She is in her first semester of college, too, and she is going to a difficult school. So, if you could add her to your prayer list, I'd sure appreciate it!! !